How Can You Upgrade Your Garage Door? Your garage door says a lot about your home. If it’s fresh, clean and new looking, it says that you care. But if it’s chipped, cracked or hung unevenly, it’s more than unattractive — it’s potentially dangerous. Creating an eyesore or a risk magnet won’t exactly give your house that special sense of curb appeal that you’re going for. Garage door replacements are more cost-effective than many other home improvement projects. With an average 85 percent cost recoup figure, you can get more than a fair return on the money you spend. If you’re considering selling your home, this is an upgrade to make. That said, it isn’t always financially feasible to do a full garage door replacement. What happens when your door has seen better days but your home improvement budget doesn’t have room for a brand-new one? Take a look at some of the ways that you can improve the way your door looks and works without a full replacement. This is one of the easiest ways to upgrade your garage door. It’s a cosmetic fix that can also help to protect your door now and in the future. If you have a wood door, worn, chipped or cracked paint lets the moisture and elements in. Of course , that doesn’t mean the rain or snow is getting into your home. Instead, it means that moisture has access to the wood of the door itself. Why is it important to protect your door? Without paint or some sort of moisture-tight seal, the wood underneath can rot or break down over time. If you have a door that’s constructed from man-made materials, this isn’t as serious as it is for homeowners who have wooden garage doors. Hiring a pro to paint your door can give you the peace of mind that you need. It can also save you time and money. Even though it may seem cheaper to do it yourself, if you don’t know what you’re doing, you might end up spending more in the long run. An improperly painted door may need a touch-up or recoat job. If you spend money (and your time) on a DIY paint job and then have to call a professional, you increase your overall costs. Whether you have chips and cracks or your garage door is just too bland for your tastes, choosing a new color can completely transform the look of your home. This can brighten your home, add to the existing décor or pull together a whole-home color palette. 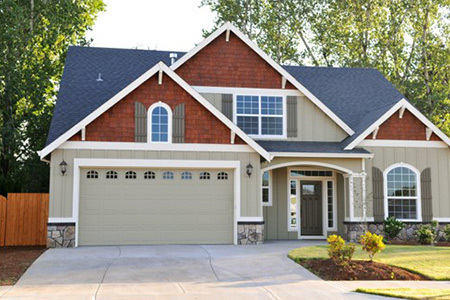 Consider matching your new garage door color with other accent points (such as shutters or the entry door). Or, you could go in the opposite direction. If the rest of your house is fairly neutral, a bold garage door color will stand out and grab everyone’s attention. Even though people walking by your home can’t see the upgrades you make inside, anyone who comes in can. This is important if you’re thinking about or are in the process of selling your house. Not only will upgrades make the interior look better, but they give you a safer door that will last longer. 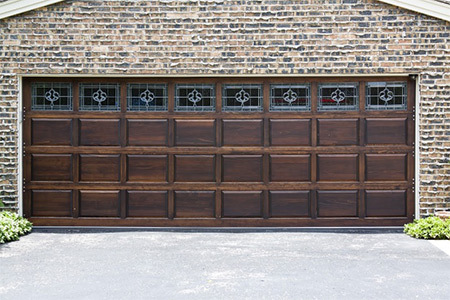 Never attempt to repair or replace the interior components of a garage door yourself. The pros know how to handle the garage door mechanism in a safe way. Basic repairs that a garage door pro can do for you include replacing cables, repairing broken springs, replacing rollers and making sure that the door is balanced. Do you need a professional to help you improve the way your garage door looks and works? Premier Door Corp can help. For your own safety, as well as the proper functioning of your garage, the majority of garage door repairs are best left to a professional. Yet that doesn’t mean that there aren’t certain things you can do to help keep your garage door in tip-top shape. In fact, being proactive about basic maintenance can greatly extend the lifespan of your garage while also minimizing the likelihood of serious problems. If you own a home equipped with an automatic garage door opener and would like to learn more about what you can do to keep it running smoothly, read on. This article will introduce you to three simple, but effective, maintenance tasks. Back in the dark ages of garage doors, most lifting mechanisms involved the use of a linked metal chain, like that found on a bicycle. While such chains are perfectly good at transmitting force from the opener’s motor to the door, they aren’t exactly quiet. For that reason, it is growing more and more common to find braided steel cables replacing those chains. Any signs of trouble should be evaluated as soon as possible by a professional garage door technician. Depending on the nature of the damage, the cable may require either repair or replacement. In either case, it is important to deal with the problem before it grows any worse. Unusual noises are the most common sign that you have put off maintaining your garage door a little too long. Rusty chain lifts are a frequent source of such noises. Yet for those who own garage doors equipped with metal cables, the problem tends to be caused by corroded or dirty rollers. The good news is that with a little elbow grease and the right kind of lubricant, you should be able to get your door working quietly once again. You will find two or three sets of rollers on either side of the door. A metal bracket holds the stem of the roller against the door, while its head is situated inside of the roller track to the side of the door. Older rollers are usually constructed from metal, whereas newer ones use a nylon body to help reduce unwanted vibrations. Both types have bearings inside of the wheel that allow them to move smoothly. Wipe away any visible gunk or grime with a clean rag. Skipping this step will cause your lubricant to become contaminated, thus greatly reducing its effectiveness. Now squirt a conservative amount of silicone-based lubricant spray onto the inside of the roller wheel. Wipe away any that gets onto the outside of the wheel; if this lubricant gets into the roller track it could cause a dangerous reduction in friction. The bracket holding the roller pins is attached to the garage door by means of several hex bolts. Over time, as a result of vibration transmitted from the motor to the door, these bolts have a tendency to become loose, and the rattling bracket will start to make a lot of noise. Check these bolts the next time you lubricate your rollers, tightening them up as necessary with an adjustable wrench. 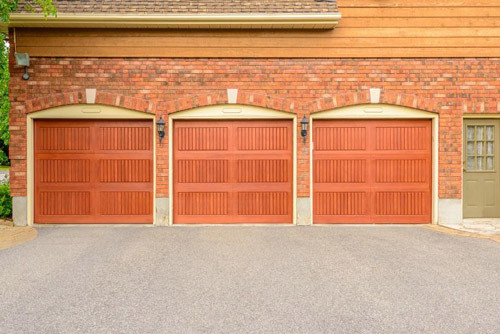 Whether you’ve been experiencing problems with your garage door or simply want to ensure that it continues to run smoothly for years to come, following these steps will help ensure that it continues functioning well as long as possible. If you feel that your garage door needs more professional help, or if you have further questions, the technicians at a garage door company such as Premier Door Corp can help.